Winter is officially here, and in the joyfulness of the holiday season, Real Property Management Metro Detroit presents a special DIY winter craft edition of the RPM blog. Perfect for any home, these inexpensive crafts are easy to create and simple to put up and take down. These earthy items are best collected in the fall and make great décor for all seasons. Prepare pinecones by either baking or washing them to rid them of insects. Once dried, apply the paint of your choice, creating a gradient look if desired. Pretty pinecones can be added to arrangements, loosely placed or simply strung together. You may remember these as elementary school projects, but these always-different snowflakes made of paper are classic winter décor and so simple to make. Fold any kind of paper and cut out various shapes. 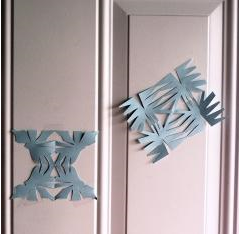 Then affix them to doors, windows or walls with clear, easy-to-remove tape for a winter wonderland. Display wintry photography in an appropriate frame to capture the essence of the season. 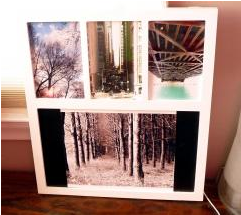 This snow-white picture frame accentuates the cool setting each photo depicts. Happy Holidays, Happy Crafting and Happy Winter!